District interviews for Rotary Youth Exchange candidates are scheduled for Saturday, January 5th and we need your help interviewing candidates. This is a wonderful opportunity to spend some time getting to know the talented students who have applied for the short and long-term Rotary Youth Exchange programs. I’ve been participating in the district interviews for five years and it truly is an enriching and eye-opening experience. The BBRC has an outstanding candidate for the short-term program, Grace Newell. She is bright, dedicated and is looking forward to experiencing a new culture. She is also Dennis Newell’s granddaughter. The annual BBRC Dine Around is coming up! This is an opportunity to gather in small group setting and enjoy a scrumptious dinner in a Rotarian home. Sign up by clicking on the yellow button at the top of the form. Get on the list before February 2. Please note if you will be attending with a spouse/guest, check if you’d like to attend on Saturday, February 9th or Sunday, February 10th. We have many wonderful hosts so come for the fun! February 3, the hosts will be notified who will be coming to their house as guests. The host will then contact their guests and let them know what they can bring to contribute to the dinner; appetizers, desserts, salads, beverages, etc. Contact Robin Callan or Ann Norman if you have any questions. 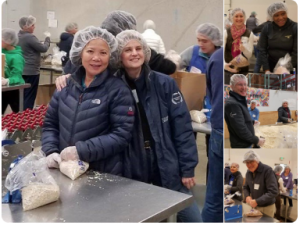 Bellevue Breakfast Rotary Club members and their guests outdid themselves at Rotary First Harvest – a program of Rotary District 5030 this morning. We had over 30 people working on oats and beans. Thank you to John Smolke and his team at Peterson Sullivan, the Forest Ridge Interact Club, Kaj & Clare Pedersen, Adam Mihlstin, Howard Johnson, Colin Radford, Andrew Face and his daughter Quincy, Eli Enger and his fiancée, Brittany Powell and Colleen Turner. The strong turnout helped Rotary First Harvest to pack 3,500 pounds of oats which equals 2,692 meals and 7,500 pounds of beans which equals 5,770 meals for our community. Our Annual Holiday Breakfast is just around the corner!! Our Family Fun Breakfast is Friday, December 21st. This is the last BBRC gathering before the Holiday Break. Bring your loved ones to share in BBRC Fellowship Fun and the Joy of the Holiday Season. We will have fun holiday food, activities for the children, special holiday entertainment and maybe even a surprise guest! Please RSVP with how many guests so we know how much extra food to have on hand! Rotarians and the 1st guest are complimentary. Each additional adult is $20 and children are $10. No need to pay online, we will collect at the door.